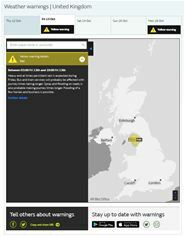 London, UK – 17 October 2017 – The Met Office has boosted the reliability of its National Severe Weather Warning System (NSWWS) by deploying Testplant’s Digital Automation Intelligence Suite. NSWWS is a mission-critical service that provides warnings to the public and emergency responders of severe or hazardous weather that has the potential to cause danger to life or widespread disruption. By deploying Testplant’s solution to automate testing for NSWWS, the Met Office is radically reducing costs and time-to-market – reducing a half day of manual testing to a 10-minute operation. Testplant’s solution has also delivered enhanced test accuracy and improved confidence in NSWWS through a 400% increase in regression test frequency. The project coincides with the 30-year anniversary of the Great Storm of October 1987, the most severe weather disasters in recent history. Following this, reforms to the Met Office’s severe weather warning systems were instigated, leading to an increased volume of weather warnings, the NSWWS service being just one of these reforms. The Met Office is the UK’s National Meteorological Service, providing 24×7 world-renowned scientific excellence in weather, climate and environmental forecasts and severe weather warnings for the protection of life and property. The Met Office has been at the forefront of global weather and climate science for over 160 years www.metoffice.gov.uk. Testplant provides user-centric, digital automation intelligence solutions that enhance the quality and performance of the digital experience. Only Testplant enables organizations to test, monitor, analyze and report on the quality and responsiveness of software applications across different interfaces, platforms, browsers, and devices, including mobile, IoT, desktop, and mainframe. Learn more at www.testplant.com. UK PR contact: Leah Jones, The CommsCo, ljones@thecommsco.com, 07876117760.